After Burundi emerged from civil war in 2005, one of the government’s priorities was to develop a professional and credible judicial system. Yet five years on, a Human Rights Watch report (2010) documented “Mob justice in Burundi: Official complicity and impunity,” and subsequent reports have continued to highlight extra-judicial killings, torture, and disappearances blamed on Burundian security forces and political gangs (Human Rights Watch, 2016). Perpetrators have enjoyed near-impunity from a weak judicial system pressured into silence or collaboration (Human Rights Watch, 2016). A notable example was described by former Constitutional Court Vice President Sylvère Nimpagaritse, who after fleeing to Rwanda said the high court’s judges had come under “enormous pressure and even death threats” to rubber-stamp as legal a disputed third term for President Pierre Nkurunziza in 2015 (Guardian, 2015). The court’s decision to allow Nkurunziza’s candidacy became a flashpoint for popular protests and a symbol of a judicial system captured by an increasingly authoritarian government. In Burundi, Round 6 data were collected in September and October 2014 – months before the constitutional crisis over Nkurunziza’s third term and the discredited 2015 presidential election, but years into the country’s nightmare of security abuses. Would respondents’ views be different now? At the time, Burundians’ levels of trust in and contact with the courts were among the highest among 36 African countries surveyed in 2014/2015. 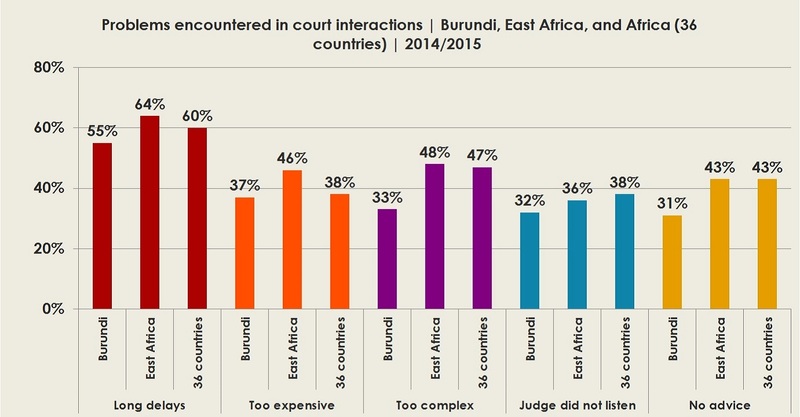 While many respondents cited significant problems with the courts – including widespread corruption, long delays, and high costs – Burundians were somewhat less likely than other Africans, on average, to complain of encountering difficulties or having to pay bribes when they sought assistance from the courts.